When I married my husband, I was lucky to marry into a really great family. They have opened their arms and have made me feel as though I have always been a member of the family. I adore my mother and father-in-law. To me they are just more than my husband’s parents or my in-laws; they are just special people who I feel lucky to have in my life. I love them both very much, and we have a great relationship. Bill and SJ Shadel are the best; I only hope that when the day comes I can be great in-laws like they are. I am an Italian-American woman—I show my love and affection with food and I cannot think of a better way to say it to my in-laws other than having them over for a meal. For the past several years, we have everyone over at our house on Father’s Day. It is great; the family all gathers at our house and we have a big cookout. It is always so much fun and of course there is so much food. When my husband and I first started to do this at our house, we wanted to plan a menu that my father-in-law would really appreciate. That would not be as easy as it sounds; Bill is just not that into eating. To say that my father in-law is a picky eater, well, that would be an understatement. I love my father-in-law like he is my own father; however toddlers have better eating habits then he does. In the almost 17 years that I have known this man, I have never seen a fresh piece of fruit pass over his lips. My father in-law could survive on cheese and crackers, bologna sandwiches and ice cream. Are the meals that bad at his house that he chooses this type of cuisine? No! My mother in-law is a beautiful cook and baker. SJ will cook Bill whatever he wants; he just does not get excited about food. SJ will try new foods and is an adventurous eater, my father-in-law, not so much. His idea of wild and exotic food is ordering fried shrimp and white rice from the Chinese takeout menu. Bill and I have always had a great relationship. I will tease him about his narrow palate and he will tease me about being from New England and being a fan of the Patriots. He has an extensive knowledge about the Steelers and has educated me about this as well as most of the Pittsburgh sports teams. Honestly I can say over the last decade I have learned quite a bit from him, especially in the area of music. Bill has a plethora of knowledge when it comes to jazz music. He not only knows about the music, he lived the musician’s life. 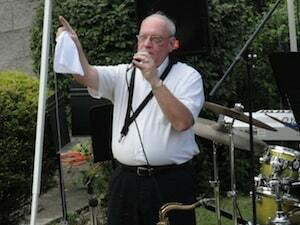 At 71 years old, he still actively plays in a jazz band; he plays the tenor saxophone. He is one of the true few Jazz men left here in the Pittsburgh area. Bill started out playing the clarinet when he was 9, but then he switched to the saxophone as he got older. He has been playing around Washington, PA and Pittsburgh over the last 55 years or so. 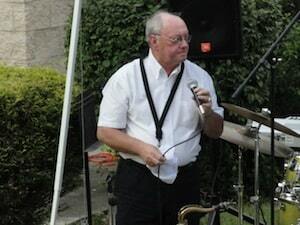 In the 1960’s he played with the Johnny Cimino Orchestra, in the 70’s with the Lee Barrett Big Band, and in the 1980’s with the Larry Falvo Orchestra; he’s been a part of smaller rock and roll groups like the Tridells in the early 1960’s, and jazz combo groups like Cool Breeze and Weekend Edition. Bill has played in various hotel ballrooms throughout Pittsburgh and Washington County, as well as on the Gateway Clipper. This isn’t a complete list at all. He’s played with so many people and in so many places through the years that it’s impossible to cover all of them in one place. One of his many talents is besides playing the sax, is doing his rendition of Louie Armstrong’s’ “What a Wonderful World” and “Hello Dolly.” This is a spot on impression, complete with the white handkerchief and raspy voice. Bill is the quintessential performer and musician. He plays to the crowd and can really get them moving. To this very day, it is amazing to watch him play. His hair may be a little greyer, and he may take a little bit longer to warm up, but at this age he still has it. His chops still have the magic touch. He still has that sparkle in his eyes when he is on stage and while he plays. My children have been fortunate enough to see him perform since they were born, and they think it is the coolest thing that their grandfather is a musician. I think it is pretty awesome thing as well, and I am proud of him. So when Father’s Day comes around, I wanted to make a special dish for Bill just to show him how much I appreciate him and love him. Bill is a very picky eater and this proved challenging, but I was up it. I made mental notes over the years of things that he really liked and tried to find dishes that may suit his tastes. He may not like many foods, but Bill hasn’t yet met a dessert that he does not like. 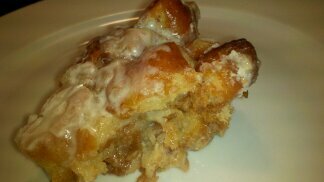 Nothing quite says I love you like a dish made of one of his favorite treats, donuts—Krispy Kreme Donut Bread Pudding! I discovered this dedicate treat several years ago, and I knew that there was only one person in the world who I could make it for, my father- in- law. I was thrilled that I found a dish that I could make for my father in-law. When I first made it for him, Bill loved the dessert and that make me happy. Every year Bill gets the first piece and I make sure to scoop a little extra on his plate for him. He tells me that he can’t possible eat that big of a portion, but he will try and do it for me because I made the dessert for him. He may not always eat all of the food at the cookout, but he always cleans his plate when it comes to this dessert. 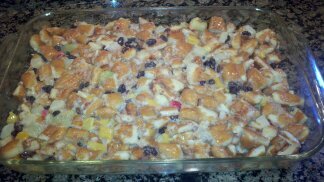 I am sharing with you the original recipe of Donut Bread Pudding from the Food Network; it’s the one that I use. This is an easy dish to make, super rich and oh so tasty. Donut bread pudding—ready to go into the oven not frosted yet! Cube donuts into a large bowl. Pour other ingredients on top of donuts and let soak for a few minutes. Mix all ingredients together until donuts have soaked up the liquid as much as possible. Bake for about 1 hour until center has jelled. Top with Butter Rum Sauce. Melt butter and slowly stir in confectioners’ sugar. Add rum and heat until bubbly. Pour over each serving of Krispy Kreme Bread Pudding. To learn more, check out my webpage at www.nickydcooks.com or Facebook page at http://www.facebook.com/nicky.d.cooks or like my fan page @ Nicky D Cooks Foodie Fan Page for more information and great recipes.